Gently used condition, wear inside bag, and the buckle is missing on flap. Condition is Pre-owned. - Flap front with a turn-lock fastening and magnetic press-stud fastening buckled tabs. - Internal pouch and zip-fastening pockets, fully lined in designer-stamped twill. - Tabs to adjust sides. Bag Depth: 4". Bag Height: 11". If possible, use the original box sent to you. Our main focus is the resale ofauthentic designer clothing, shoes, handbags and accessories. Does not diminish the overall appearance of the item.Very Good - Well-maintained. Back side under flap has slip 2 pockets. The item is in a very good condition very clean. Authentic Mulberry handbag. Brown leather. Authentic Mulberry handbag. Brown leather.. Condition is Pre-owned. Shipped with USPS Priority Mail. Mulberry Authentication Label. Plaid Fabric Lining. Interior Zip Up Wall Pocket. Gently used condition with minor signs of wear. Corners and handles in good condition. The colors are bright and, seams are tight. Material :Leather. Color : Black. We apologize for inconvenience. Code, Number etc. : 191889. or collected when you pick the item up. 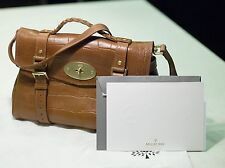 Nice Mulberry brown leather crossbody saddle bag purse, in super condition. Condition is described in my opinion which may not be your own. Side D rings for the shoulder strap. Interior has 2 slot pockets and 1 zip pocket. TALL 7.75". DEEP 5.5". Antiqued gold-tonehardware mulberry reading on buckles. Adjustable flat shoulderstrap, Dual flap, two front pockets, closure at front strap. COLOR :Soft Pink leather. INTERIOR NATURAL LEATHER. In nice conditionwith normal wear, it the interior it has a small stain ,scuffs etc. allaround/exterior /Interior handle/etc. 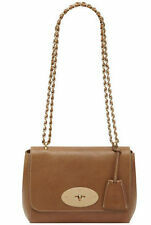 ​natural beige color canvas with genuine leather crossbody handbag/ shoulder bag. Made in England. CLASSIC AUTHENTIC MULBERRY SADDLE. 100% AUTHENTIC MULBERRY. MULBERRY SERIAL NUMBER DISC ON SIDE OF THE BAG. LEATHER PLAQUE INSIDE BAG SAYS 'MULBERRY MADE IN ENGLAND'. BROWN CROC PRINT (CONGO) LEATHER. Size 11.75”x7.5”. Used few times. Very clean condition inside. Interior Lining : Suede. Style: Shoulder Bag. Color: Tan. Material: Leather. Interior Color : Tan. Pattern : None. Production Code : 025183. Who wants to wait months on end watching and waiting to receive a check?. Mulberry Bayswater White Leather Satchel Purse Large. Gold Hardware. Style: Elegant, High-End. Condition is Pre-owned in a good condition. Exquisite Black Leather Mulberry handbag in good condition. Bag has Scuffs from everyday use. Bag is very spacious . Please look at pictures for more description. Payment is due 48 hour after auction. Before you leave a negative feedback, please contact me so I will try and resolve the problem. Happy bidding. Designer: Mulberry Condition: New without tags! Color: Blue Gray Material: Corduroy & Leather | Faux Shearling Lined Hardware Color: Gunmetal Height: 10" Depth: 5" Length: 12" Strap Drop: Short Strap- 2.5", Long Strap- 22". Saddle leather. Detachable shoulder strap. Exterior material: Pebbled Spongy Patent Leather. HARRIET TOTE. Mulberry tree fabric lined interior. Pale gold hardware. Color: Beige. Internal zip pocket. Internal slip pocket. External pocket with squeeze-lock closure. BRAND NEW. GENUINE LEATHER. MADE IN ENGLAND. Chestnut embossed leather Mulberry satchel with gold-tone hardware, flat shoulder strap, rolled top handle, woven leather trim, interior wall zip pouch and snap closure at buckle embellished front flap. It is in good condition. Wear consistent with age and use. Inside the bag there are some light pen markings. The flap opens to a fabric interior with a zipper pocket. Color : Brown Cognac. Condition : In very good condition. Any signs of use are minor. There are light scratches / wear to the hardware throughout. The flap opens to a fabric interior with a zipper pocket. Color : Brown Cognac. Condition : This bag is in very good condition. The leather looks great and is still in near perfect condition. The interior is very clean, free of marks or odors. MULBERRY Slouchy Satchel Handbag. Brown leather construction. Main center zip section with cell pocket plus two open side sections. Fold-over flap with turn lock top closure. Dual carrying handles with 9" drop. Of course, our unmatched selection of archive fashion is only half of the picture without a dedicated team of on-point stylists to back it up. Happy hunting! Style Bag: Shoulder Bag. Category: Bags & Leather Goods. • PINK OSTRICH LEATHER BAG. 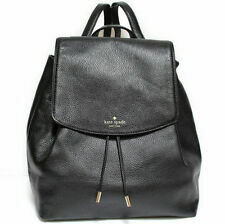 • MULBERRY. • SMALL WILLOW TOTE BAG. A woman or man born to elegance or born for it. Distinctive, stylish green patent leather hand bag by MULBERRY! Elegant and sophisticated, a beautiful bag! The exterior is sleek and reflective, creating a unique silhouette. It's like wearing a piece of fine modern art! Style: Shoulder Bag. Material: Leather. Pattern : None. Production Code : 1089921. Each year counterfeiters work hard to perfect their knock-offs. Color: Black. Interior Color : Black. Who wants to wait months on end watching and waiting to receive a check?. Beautiful vintage Mulberry Co. clutch purse. Well-made in England from thick, smooth, rich tan/light brown leather. Front flap is woven for some nice texture, with snap closure underneath. Roomy interior is lined in solid brown and has a zippered pocket with the early Mulberry patch. Measures 13"x 7"x 1..5". Clean and in very good pre-owned vintage condition. ***PLEASE See ALL Photos ENLARGED*** For MORE Gr8 BAGS & PURSES Visit My eBay Store~ BAGALOO2~Thanks for Looking!. Pre-owned bag. The right side of the bag has a small peel mark. The hardware has scratches and tarnishing. Inside the bag there is a large stain. The inside lining and inside pocket have use and penmarks. Mulberry Bayswater Double Zip tote, this is the larger version 14" long x 6"w x 10" H. Both the handles and shoulder strap are adjustable. The interior belted sides can be adjusted to give more space inside, making a BAYSWATER ideal for any lifestyle. This iconic leather bag can be carried by the handle, in the crook of the arm or over the shoulder. 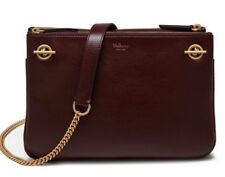 Wonderful designer Mulberry brown leather cross body bag purse. In great pre-owned condition. Little to no wear. Brass hardware. The interior is an unfinished raw leather with a zippered logo pocket. Unused item. I purchased it myself from the NYC mulberry store. Please feel free to ask if there are any questions. PayPal only! This idea still inspires us.